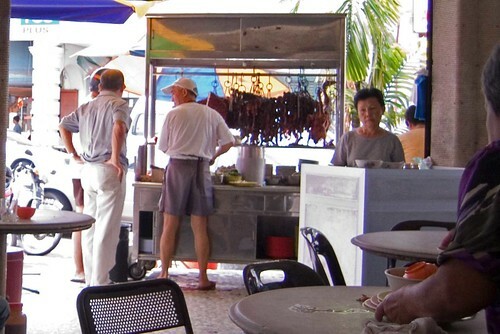 Few people know there is a very famous chicken rice stall at Chulia Street. I got to know about it when my colleague recommends it to me. The stall lies along Chulia Street (Lebuh Chulia) in Georgetown. The stall is located in a shop lot painted in green whereby its upper floor is a motel. 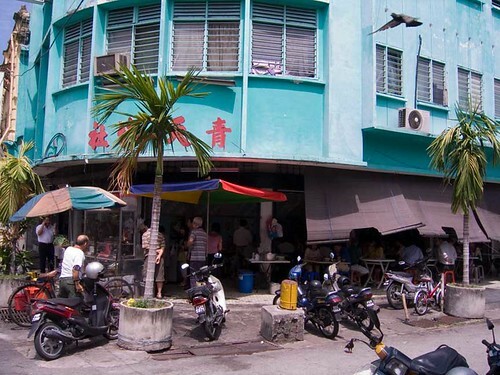 The shop lot is a corner lot and it’s easily spotted when you are driving along Chulia Street. The street can get very busy during lunch hour. Therefore, it’s pain in the neck to find a parking lot in this area especially during peak hour. The chicken rice stall at Chulia Street. People are lining up waiting for their orders. For me, I usually drive into the back of the shop for parking space. There is a one time charge of RM2 per entrance though. I think it’s pretty worth the money thinking of I will be treating myself to one of the best chicken rice in Penang. I usually go there in the weekdays for lunch. I am not sure if it’s open for dinner. I doubt it since the stall will usually sell out all its food around 1pm. So I usually get there around 12 noon. The best time to get there is before 12 noon if you don’t want to be standing besides tables waiting for people to finish their meal. it's always this man who does all the work of preparing the meal. It's a one man show. The rest are only serving and collecting pay. 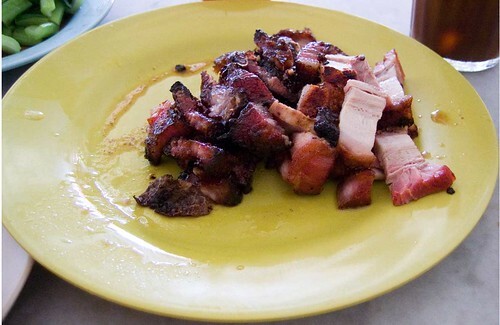 Although its main dish is chicken, it does serve other dish such as roast pork and duck as well as char siew(a different kind of roasted pork). I usually order a plate of chicken and a separate plate of roast pork, duck and char siew, both plates serve two persons. On top of the meat, there will also be a plate of vegetables and a bowl of soup which come in a separate order. I personally like the chicken very much. It’s the signature dish for this stall. It’s different from most of the chicken served in a typical chicken rice stall in Penang Island. 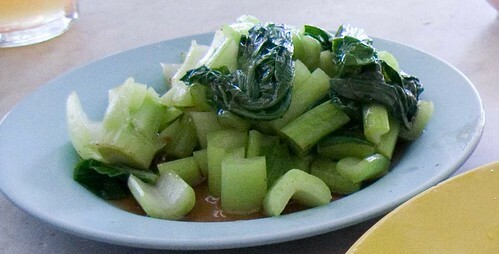 Usually in a typical chicken rice stall, they serve roasted chicken in which the skin will be roasted to golden and brown color whereas this one has the steamed chicken in which the skin is still yellowish. The gravy for the chicken comes in a small bowl and it has excellent taste. The rice is also topped with this particular gravy which renders it a special aroma. 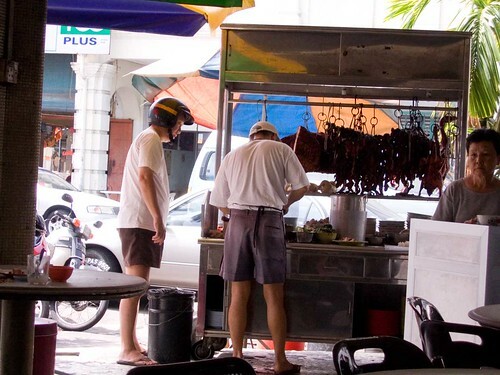 the chicken rice stall. Yummy! which are also served here. I am starting to feel hungry whenever I see these pictures! The only vegetables served at this stall. Tasty! on to the meal. You can also see the bowl of gravy for the chicken. I usually go there with my wife. Therefore, when I place the order, I just have to mention it’s serving two persons. The last but not least, this will really surprise you. All the above dishes cost me only RM17. The total price will come to a little over 20 including the parking and the drinks. It’s really a hefty meal that is a bargain in Penang. Anyway, do go there to try it out! Previous post: Can You Afford to Climb Mountain Kinabalu?